Surely it is only fair that the Australian people fare better out of all this plundering. ABC Online confirms the Tony Abbott’s Opposition has formally announced it will not support the Government’s plan for a super tax on mining industry profits. Until now the Opposition has given strong indications that it would not back the tax, but Tony Abbott has confirmed his position, describing the Government’s policy as a tax grab from the industry. “You can’t trust Mr Rudd with the management of the economy. He is proposing to put the highest taxes in the world on the sector, which more than anything else has kept Australia going through the global financial crisis,” Mr Abbott said. The Abbott Opposition continues to oppose things for opposition’s sake. However he is caught in a lie as Peter Martin does it again and points out this Resource Super Profits Tax was the brainchild of the Minerals Council of Australia. Not to mention such a tax is supported in the arch conservative Alaska in the United States where it has been a real boon. While many other [U.S.] states are confronting big budget deficits because of the troubled economy, Alaska officials are in the enviable position of exploring new ways to spend the state’s multibillion-dollar budget surplus. Whilst there is every chance that he simply changed his mind after examining the evidence, but Possum Pollytics points out the much more likely shift from a theoretical framework to practical application has turned it into a lobbying exercise to cut the best deal. Even the media has been caught out supporting the lie. A lie they are now backtracking from since Rio Tinto denies expansion plans have been shelved. In amongst all this, it needs to be remembered it is a tax only on what has been dubbed ‘super profits’, not profits and it will only apply if a company achieves super profit status which is set to the long term Government Bond Rate. ONE is if the tax is a good idea why only apply it to the resource sector? If it is a low distortion tax then it should apply more generally, perhaps to the banking sector? TWO is that it should be set a lot higher than the long term Government Bond Rate. It seems we would be wise to listen to the caveats Bernard Keane expounded the other day. 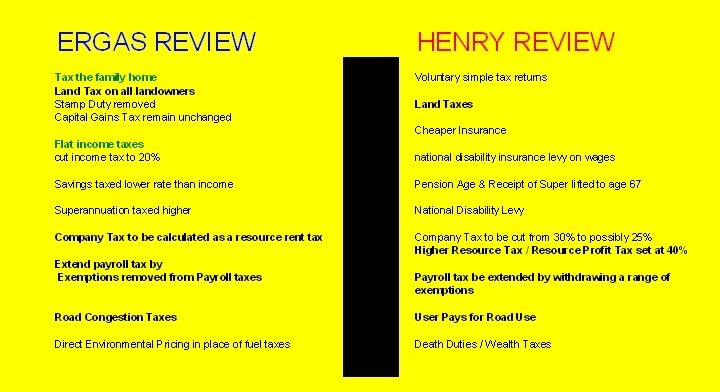 This is what I see as the great missed reform of the Henry Tax Review that the government is yet to adopt. Although the system would seem to tax Australians on quite low wages at the same rate as those on quite high incomes the review includes a graph to show that the very generous $25,000 tax-free threshold would have the effect of making the average tax rate progressive in a more simple way than at present. A tax scale of this kind could be implemented gradually, taking into account existing settings on marginal tax rates, offsets and the definition of income. I say let’s get on with it. I believe this suggested reform can be a real vote changer. This is good for progressive tax proponents with the sufficient tax free threshold, the only decent one ever recommended and progressive tax brackets. It should also keep the flat taxers with the 35% rate happy. A land tax will not work. A land tax can only work where it meets economies of scale. That means it can only work in the major coastal cities of Australia and nowhere else. It deprives those that manage to pay off their mortgage or first home buyers, etc of having the security of an actual home unless it becomes a business, i.e. becomes productive. It deprives those in country-coastal towns and even more of those that live inland. The reason there is so many speculators on land and housing, primarily in housing is because it is the only way to make any significant money. You can do it about every 10 years as Real Estate’s about the only product that you can buy that appreciates. Arguably the stock market is another way but that takes at least 20 years and you have to avoid watching your stocks every minute and hope someone doesn’t buy out the companies your stocks are in so you end up with nothing. When I see TV shows like Hot Property the fools that buy a house for $700 000 and over a million dollars… Generally because the house they are buying is only worth it due to the foolish idea of location, location, location, i.e. usually beachfront. Even more so when the house depending on the size would only cost around $200-300 000 to build. It is not reasonable. I do not own property but I know there is no way that you can ever possibly save enough to buy a home outright and live within reason on the median-to-average wage. Sure you can get a mortgage but then that’s another 30+ years to pay off. And in today’s economic climate where job insecurity is paramount and rising interest rates. The only solution is to do what is suggested in the article, get multiple-properties, pay off the principal-of-interest on the loans and every 5-10 years sell the house. You may also need to account for some housing upkeep and thus make a loss, as it is money out of your pocket – hence negative gearing. It is the only way to get ahead. It is the only way for the average, perhaps even median person in Australia to make any money. To which someone called grputland replied to the fact that I said land tax takes away the security of those who have paid off their homes. My answer: Only if it applies to owner-occupied residential land, and only if the owner-occupants can’t pay it. The latter condition holds for any other tax and, for that matter, any other debt. In general, if you can’t pay your debts, you go bankrupt and lose your house. But this is LESS likely to happen with land tax, because the tax is commonly allowed to be deferred until the property is next transferred. He also seems to think land tax discriminates against country and inland areas. Not so. Because the highest land values are in coastal cities, greater reliance on land value taxation would AUTOMATICALLY give much needed tax relief to struggling rural towns (without technically violating any constitutional strictures against discriminating between locations in matters of taxation). Your assertions were well answered by grputland. Read them carefully. I am happy to accept grputland‘s caveat it only applies to owner-occupied residential land, and only if the owner-occupants can’t pay it. Whilst I can accept in theory that a land tax assists regional and rural areas (my area) but as I’ve said previously political reality tells me the politicians will hold revenue for that back as a sweetener for something else, most likely in a high density urban area. Require parents to work when their youngest child turns 4. These have all been ruled out – most with good reason in my opinion. Peter Martin also mentions we should not confuse Swan’s proposals with the recommendations of the Henry Review which is exactly what I did here with the superannuation proposals. Taxes on alcohol should be set to address the spillover costs imposed on the community of alcohol abuse, when this delivers a net gain to the community’s wellbeing and is more effective than alternative policies. Raising revenue is a by-product, not the goal, of taxing alcohol. The tax rate should be based on evidence of spillover costs, and levied on a common volumetric basis across all forms of alcohol, regardless of place, method or scale of production. A common volumetric tax on alcohol would better address social harm through closer targeting of social costs. A rate based on evidence of net social costs would help balance the benefits from alcohol consumption with its social costs. Moreover, by removing the distinction between different manufacturing processes, the compliance and administration cost of the existing excise system would be reduced. The transition to a common alcohol tax should be phased in over a longer term, to ensure that producers and consumers have time to adjust to the changes. After reading that recommendation in the Henry Review I do not see anything particularly wrong with that proposal. The Government has opted for no changes in stamp duty across the States because it would be replaced by a land tax. This is a complex regulation to change as it involves federalism and I imagine would have to be subject to discussion at a COAG meeting. Also to put a bit of a personal spin on it if it’s a typical land (value) tax which in theory assists regional and rural areas (my area) but reality tells me they’ll hold revenue for that back as a sweetener for something else, most likely in a high density urban area. Revenue from fuel tax imposed for general government purposes should be replaced over time with revenue from more efficient broad-based taxes. If a decision were made to recover costs of roads from road users through fuel tax, it should be linked to the cost of efficiently financing the road network, less costs that can be charged directly to road users or collected through a network access charge. Fuel tax should apply to all fuels used in road transport on the basis of energy content, and be indexed to the CPI. Heavy vehicles should be exempt from fuel tax and the network access component of registration fees if full replacement charges are introduced. I do not and cannot agree with heavy vehicles being exempt from fuel tax, i.e. trucks, they are the ones that have the most road use and thus cause the most damages to roads which make the roads dangerous and they are to be exempt from a fuel tax. It just does not make sense. Do you think the goods on the trucks will get any cheaper or do you think the companies, etc, will pocket the extra cash? My reasoning here is similar to the opposition of the abolition of the luxury car tax. Fuel tax will hit those that live the farthest from metropolitan regions than those that live on the metro doorsteps where the median income is much higher. It does not strike me as a sensible proposal. People with the same economic means will pay different amounts of tax depending on their tastes. Wealthy people with modest tastes pay less than wealthy people with a preference for luxury goods. Australia’s current luxury tax, the luxury car tax (LCT), is particularly arbitrary in its impact. It falls on people with a preference for relatively expensive cars, but not on those with a preference for diamonds, fur coats or yachts. Luxury taxes should not be used to raise revenue. They are inefficient because of their narrow base. Taxing luxury goods is also an ineffective and arbitrary means of redistributing economic resources. This is one of the sillier things I have seen. A little extra tax will not hurt those accustomed to a certain lifestyle, a little extra tax can mean life and death for those just trying to afford the next payment on their first owner-occupied home (and I do not mean to imply that is proposed, it is not!). Rather than abolish the tax, perhaps they should also tax luxury diamonds, luxury fur coats and luxury yachts to keep it progressively equitable. I am paraphrasing a little here but public housing has the potential to lock people in to depressed areas and to discourage moving for work. Thus the Henry Review recommends charging market rents and lifting rental assistance offered by government agencies considerably and indexing it to consumer inflation. Provided the rental assistance is lifted to a sufficient level to accommodate adequate housing in ALL regions I can approve of this recommendation. It seems this is not in the Henry Review as all, as it recommends that the owner-occupied housing remain exempt from means tests and I would consider owner-occupied housing the family home. While the employment rate of single parents has increased, there is still a sizeable gap between their employment participation rate and that of partnered mothers, especially while the children are young (see Chart F1-7). Where there is a child younger than four there is a 25 percentage point gap; for a child aged over four and up to sixteen the gap is 8 percentage points. There is no gap between employment rates of single parents and partnered mothers when the youngest child reaches 16 years of age. These differences may to some extent reflect selection biases (as indicated by lower average wage rates and education levels for single compared to partnered women). When single parents do work they have higher median hours of work than secondary earners in couple families. However, it is also the case that Australia’s assistance to single parents is among the most generous in the OECD (Whiteford 2009, p. 49). Also, Australia has the fourth-highest joblessness rate in the OECD for households with children, and this joblessness is concentrated among single-parent families (Whiteford 2009, p. 57). Another policy consideration is the growing evidence that long periods out of the workforce reduce the probability of eventual employment and harm both single parents and their children. For couples and single parents with a youngest child under six years, the amount of the supplement should be set such that the total support for single parents on income support will be equivalent to the maximum rate of pension. The supplement would be paid through the family payment system. For single parents with a youngest child aged six or older, the supplement should be paid at a substantially lower rate through the family payment system. For couples with a youngest child aged six years or older, the lower rate supplement should be paid through the income support system. There should be no necessity in Australia for both parents of a child to work if one of the couple prefers to be a stay-at-home housewife/househusband. The system should not punish couples that seek to live as they seek fit provided at least one is in paid employment. Whilst it is recommended for single mothers to return to work as soon as feasible because of the difficulties of finding work the longer you are unemployed; they should not be forced to at the age of four. The start of schooling age, five/six is much more acceptable. In summary I support the current government’s stance on opposition to abolition of the luxury car tax, fuel tax, land tax. I also recognise the complexity of politically passing on some of these recommendations as some involve the removal of state based taxes which means a co-operative federalist approach is required. This would most likely occur at a COAG meeting. I also support their opposing stance to parents returning to work when their children turn four but with caveats. I can support the Henry’s Tax Review recommended changes to the Alcohol Tax, it is just common sense. The core of today’s announcement is the resources profits tax. From 1st July 2012, mining companies will pay a tax of 40% on its profits which are designed to pay for a rise in superannuation to 12% by 2019/2020 and to cut the company tax rate down to 28% and most likely 25% in the future. 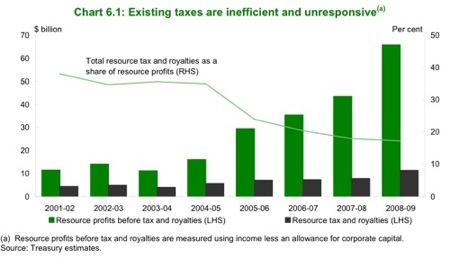 The mining industry is not being punished as it first may appear as they will receive 10% of the resource profits tax back as a resource exploration rate and the State based royalties they now pay refunded. The Government has decided it will build on the $22 billion Nation Building for the Future package by establishing a new ongoing infrastructure fund, and make annual contributions starting at $700 million from 2012-13. The best result seems to be for small business whereas currently they have keep a range of records and classify the assets they buy into a number of depreciation ‘pools’. Small items worth less than $1,000 can be immediately written off and others allocated to one of two depreciation ‘pools’ which are depreciated at either a 30 or 5 per cent rate depending on the life of the asset (half these rates in the year of purchase). The Government will introduce instant write off for small business assets worth up to $5,000. This means many small business investments will be able to be written off in the year of purchase. Small businesses will also be able to depreciate all other assets (other than buildings) in a single pool, at a rate of 30 per cent. This means small businesses won’t need to do complex tax classification of different asset types. These changes will let small businesses write off many assets more quickly, increasing their cash flows at the time when they are investing to grow. They will also move straight to the new 28 per cent company tax rate from the 2012-13 income year. This will provide a direct financial benefit (and, as a result, a cash flow benefit) and will act as an incentive for small business companies to retain profits to grow the company. Whilst other businesses will have to wait until the 2014/2015 tax year. The real plus to the superannuation changes is that from 1 July 2012 the Government will provide a contribution of up to $500 for workers with incomes up to $37,000. This ensures that no tax will be paid on superannuation guarantee contributions for those with incomes up to that amount in 2012-13. It will also allow older workers make twice the contribution what the current cap allows. The government believes these changes are expected to increase average real after-tax wages by 1.1 per cent in the long-run. In current terms, this reform dividend is equivalent to having around an extra $450 per year in the pocket of a full-time worker on average weekly earnings and have a divident of 0.7% increase in the GDP in the long run. It is clear from the outset that the independent reviews on the Australian Tax system have plenty of common ground. Both agree on land taxes, changes to company tax, road use taxes and the extension of payroll taxes by removing exemptions. The Henry Ergas Tax Review was commissioned by then Shadow Treasurer, Malcolm Turnbull back in April 2007. The Rudd government followed suit in May 2008 with the budget after the Ergas review finally began in March 08. Both reviews are now completed and currently gathering dust. The Rudd government has consistently said it would release the Henry review in early 2010. Most recently, the Treasurer, Wayne Swan has said the review would be released by Budget time. Both reviews may agree on changes to company taxes but differ on what changes to be made. Ken Henry reckons cutting company tax below 30% but no lower than 25% will be quite beneficial. Henry Ergas believes company tax should be treated as a resource rent tax. What is currently in the public domain of the Ken Henry Tax Review does not seem to mention income taxes. The Ergas Review as shown above however does suggest a 20% flat income tax1. Not completely flat, because that would be too hard on low-wage earners. By setting the flat rate at 20 per cent and by retaining a tax-free threshold and also making ”negative income tax payments” to low-income earners, the system would become somewhat progressive but also ”as close to flat as one could reasonably get”. The Henry review believes mining companies have been treated too generously. It expressed bemusement at the 50 per cent discount applied to income taken in the form of capital gains introduced by John Howard at the start of this decade, noting that income earned from work attracts no such concession. It will recommend either a higher resource rent tax or a switch to a resource profit tax. The Henry review will recommend payroll taxes be extended by withdrawing a range of exemptions as it sees them as pretty harmless. There are taxes that do genuinely hurt employment, and the review believes they are those that discourage foreign firms from setting up here and staying here. This is broadly in line with the Garnaut review on carbon trading which says there should be a global system in place and a national scheme can be operated on top of that as well. The Ergas review of Payroll tax suggests the same thing at a national and state level. Whilst I have not covered everything, as you can see two economists from ideologically opposed sides can broadly agree on many issues. If only it was the same for our parliamentarians and the broader public debate. Peter Martin, what would we do without you? 1 See Essays for more information on Flat Taxes.